The following free letters, numbers, and alphabet stencils can be used to print individual characters or letters or combined to create word art. 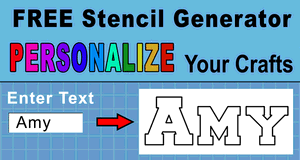 For maximum control, use the free online stencil maker to create your own printable letter stencils. 1. Free Stencil Maker – Online Calligraphy Generator. 3. Bold Script – letters will join up or connect like handwriting. 4. Letter Stencils – with designed gap typeface. 5. Tall Block Serif Stencils. 6. Jersey Numbers (Athletic, Uniform) Stencils. 7. Printable Stencils – with designed gap typeface.